The Departed has expanded and enlarged many of the original elements from Andrew Lau and Alan Mak's Infernal Affairs. Much of the credit should go to screenwriter William Monahan for simply not making a shot-for-shot remake, but reshaping the film to much more of a character study that explores the relationships more deeply than the original. This is not to say that Infernal Affairs is in any way a lesser film, those who haven't seen it are encouraged to view the Hong Kong original and compare. What Monahan and Scorsese are far too intelligent to do a mere remake, The Departed might be better called a re-creation in the image of the filmmakers. As I wrote about last year, Infernal Affairs was in part about the Buddhist concept of Hell. Co-writer/co-director Alan Mak is a Buddhist, although it should be understood that it is not the same as that expressed by the Infernal Affairs chief villain portrayed by Eric Tsang. The Departed's character are mostly Irish Catholic. While the Irish identity is strong, the attitude towards the Church is ambivalent at best. Identity is a central theme throughout the film. The Departed is about professional and personal disguises. The title is an interesting choice. A concurrent theme is how the dead influence the living. DiCaprio's Billy Costigan chooses to join the police force following the death of his mother, while the South Boston gangsters' memories of his father is the key to his being enlisted by Jack Nicholson's Frank Costello. Death in The Departed reveals a previously unknown truth about a character. 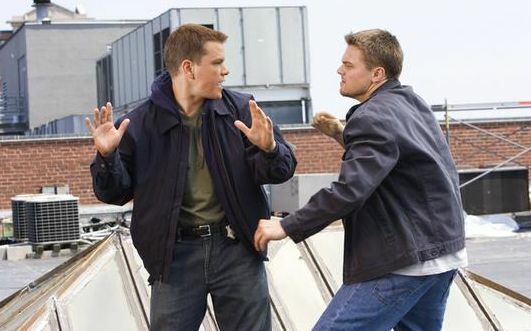 The almost constant rage of the characters makes The Departed the closest to Mean Streets. It's almost as if one was seeing several variations of Robert De Niro's volitile character Johnny Boy. While the violence is identifiably Scorcese's, there is also almost constant music, with the Rolling Stone's "Gimme Shelter" given prominent play. A brief clip from John Ford's The Informer is appropriate given both the plot and the emphasis on Irish ethnicity. What also needs to be mentioned is that The Departed is quite funny, primarily because of the continual insults hurled between characters. DiCaprio, Damon and Nicholson provide the star power, but the two to watch are Mark Wahlberg as a profanity spewing police sargeant, and Ray Winstone as Nicholson's top thug. In reference to Mean Street, the influence of that film could be seen most clearly in Wong Kar-Wai's As Tears Go By. Scorsese has been an important filmmaker to several Hong Kong filmmakers. It may have been fortuituous that Scorcese directed The Departed. For those unfamiliar with Infernal Affairs, the film can stand on its own merits. For those who have seen Infernal Affairs, consider The Departed a dialogue between filmmakers. I really liked the movie, too. Even though I had seen INFERNAL AFFAIRS, I believe Scorsese really didn't watch it before making this because you'd think he would have somehow, even unconsciously, aped something from the previous movie and the visual styles are totally different. I was really impressed with Monahan's script. You make a good point about how death hovers over the entire picture. It's nice to see Scorsese back in the saddle again. And Nicholson, too.